so you begin the process of true forgiveness. trying to grasp the reality of a spouse’s unfaithfulness. Understanding the boundaries of what forgiveness is and is not, will be an important part of your recovery process. Forgiving someone who has wronged us is never a natural thing for us as human beings. Our human nature is to want justice or revenge on the one who has done something against us. 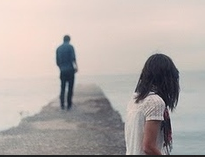 How much deeper is the wound when the infraction was done by someone we love and vowed to spend our whole life with. So, the question always comes back to: how will you forgive your spouse for infidelity? Is it even possible to truly forgive your spouse after you have been so betrayed by their unfaithfulness? I believe the answer is yes, but it will depend on you, as the betrayed spouse. First, let’s clarify what forgiveness really means. “To give up resentment of; to grant relief of payment. To stop feeling anger toward one who has done something wrong. Those sound good on paper but how to live them out is another story. There are things to keep in mind as you question whether you can forgive your spouse after they were unfaithful. 1. True forgiveness is not conditional. If you base your forgiveness on whether your spouse ends the affair or does everything right, your forgiveness level will be up and down like waves in the ocean. Besides, it would be a conditional forgiveness, which is not true forgiveness at all. Remember our Webster definition? “To grant relief of payment..” If we wait for our spouse to get it all together before we forgive, we are still expecting payment (i.e. “I will forgive when you are worthy of forgiveness”). No, true forgiveness happens independently of the person’s actions or responses. 2. Forgiveness is not really about them, it’s about you. Forgive, no matter what the future holds for you. Whether your marriage survives or not, forgiveness is still important for your own healing. It is all about releasing you not your spouse. When we are in pain from a betrayal, it is easy to forget that our anger, although justified, only hurts us and holds us We become imprisoned by our anger and resentment. The tapes of betrayal that get replayed over in our minds are the keys to our jail cell refusing to release us. As long as we replay the offense over and over in our minds, we become the prisoners of its hostility. If allowed to fester and grow, we will become people we, and others who know us, no longer recognize, and not in a good way. 3. Forgiveness does not equal trust. Although both are important to the marriage being restored, they are separate entities and processes. You can forgive someone before you actually trust that person again. As Ronald Reagan was famous for saying “Trust by verify.” And that’s okay. It is easy to get forgiveness and trust confused. The unfaithful spouse needs to understand trust will probably take much longer to be restored than forgiveness will. But as the unfaithful spouse does all the right things to facilitate healing, trust will grow again. Yet, what is trust if the betrayed spouse has determined not to forgive? The marriage still will not survive. So forgiveness usually comes before trust. 4. Forgiveness does not mean you condone their behavior. It is possible to forgive the person and not condone their behavior. Sometimes people feel if they extend forgiveness, the other person will think they are okay with what they did. Or, they’re afraid the other person will not understand how deeply the offense hurt them. Of course, it is important to get those feelings out. You cannot rush the forgiveness process. Expressing your pain to the wayward spouse is important for healing, as long as you don’t stay stuck there. They have a debt they can never repay, it doesn’t matter how sorry they may be, the past is the past. True forgiveness acknowledges the depth of the offense and the seriousness of the behavior, but chooses to free that one from their guilt. It doesn’t mean there aren’t consequences to the behavior, there always are consequences, but the prison sentence is ripped up instead of enforced. 5. Forgiving someone does not make you a weak person. I’ve heard many people say they feel like they are the weak ones if they choose to forgive their spouse of their affair and that others will look down on them for it. It is a common feeling, but remember you are doing the harder thing. The easier way is to go with what is natural to us, and stay angry. It doesn’t take much effort or work to accomplish that. But the stronger soul is the one who can learn to release that spouse from the debt they can never pay. That kind of forgiveness is a rarity today, and something very admirable. Weak people follow the crowd. Does that mean you allow yourself to be continuously taken advantage of and become a doormat for them to not respect? Not at all. Boundaries still should be set and kept. Strong people do the hard things that are contrary to how they feel, which leads to number six. 6. Forgiveness is not a feeling. 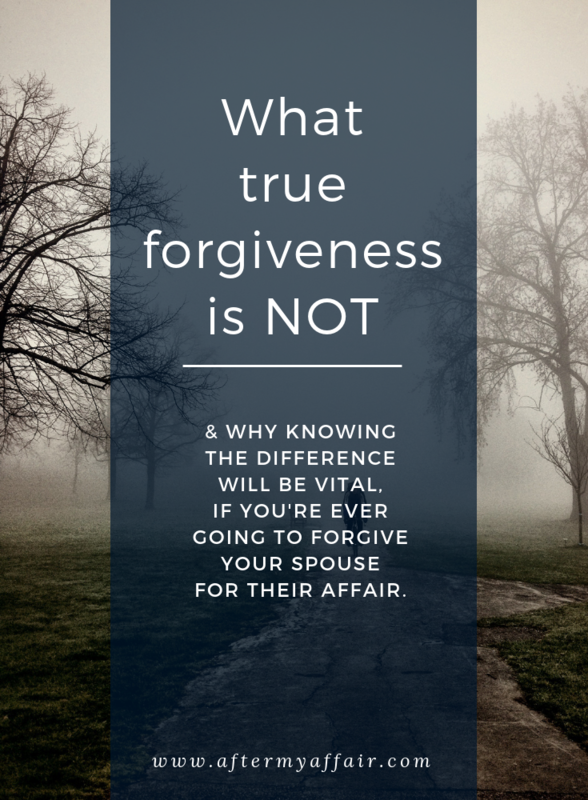 Forgiving your spouse is a conscious decision. You may not feel like forgiving, but forgiveness is often not about how you feel but your decision. When our feelings are screaming at the injustice of it all, it’s hard not to follow our feelings and stay angry. although forgiveness is not easy, it’s possible. It can’t be conditional or based on your feelings. Forgiveness is not about them, it’s really about you and freeing you from the prison of resentment. Forgiving someone does not mean you trust them yet, and it’s not an approval of their behavior. Trust needs to be earned, but nobody can ever truly EARN forgiveness. Forgiveness is also separate from setting boundaries with that person. Boundaries are a loving way to tell the other what is expected. What will you, or won’t you, tolerate? True forgiveness recognizes the seriousness of their offense, but chooses to declare them free from having to repay you. Because how can anyone ever truly do enough to repay after infidelity? Finally, choosing forgiveness is one of the hardest parts of the recovery process after an affair. But when you learning to forgive makes you a stronger person than most, not weaker because you forgave. How about you? Are you struggling to forgive your spouse, or someone else? Which one of these resonates with you the most about what forgiveness means and doesn’t mean. (i.e. Trusting them or still having boundaries…) I’d love to hear your comments and input below.